An interesting account of a teacher who became a homeschooler. Homeschooling . . . was not on my radar when I was dreaming and planning my future as a mother/parent. I have a degree in Early Childhood Education and I looked forward to having my little ones with me until they were school aged and then becoming a part of their school lives as a room parent or school volunteer. Preschool was good for both of my children. I have a daughter, now seven years old, and a son who is almost six years old. The curriculum, the setting, and the staff were all what I expected and anticipated. 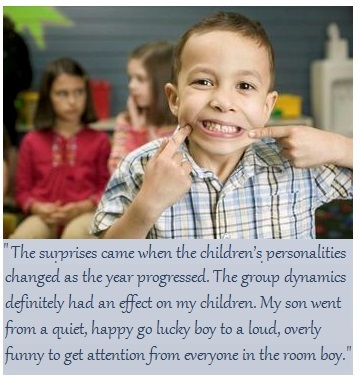 The surprises came when the children's personalities changed as the year progressed. The group dynamics definitely had an effect on my children. My daughter flourished making friends and doing well with all of the activities. She moved on to the next year and then too she did well. My son has some speech needs, articulation issues, which were being addressed. His group had several children with varied issues: mild to moderate in nature. My son went from a quiet, happy go lucky boy to a loud, overly funny to get attention from everyone in the room boy. He did not move on to the next class per my husband's and my choice. The staff had already deemed him a "class clown who did not listen." As a parent I struggled with this comment; as an educator I know that there are preconceptions. . . I had hoped that the staff would keep an open mind. In this instance that did not happen. As this was unfolding for my son, my daughter was getting ready for Kindergarten registration. She was excited and anxious. Our school district had a series of meetings, seven I think, for the parent and child to attend together. 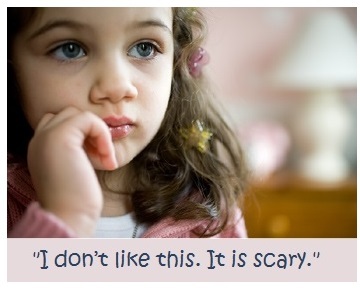 She cried; she was afraid of the other children – not her typical reaction. We pushed her a little. . . "This is getting you ready for kindergarten and these are going to be some of your classmates and teachers." She was adamant and persistent. "I don't like this. It is scary." She was registered and went to her first day of the registration with testing at the school she would be attending. She was tested, met the teachers and the principal. She cried and was not happy when we left the building. Again, not her typical reaction. We started talking to other parents, friends and family. Listening to them and trying to pin point what would help. School is supposed to be and should be a fun place for children. Not a scary place. We looked at private school. Too expensive and we would need to provide our own transportation . . . with rising gas prices this was not a viable option for us. Within our Church there were several families that homeschooled. We started talking with them. They offered lots of information: pros and cons as well as suggesting that we look at/visit some local homeschooling associations meetings, groups and websites. We did and after much thought, discussion and prayer my husband and I agreed to try homeschooling for three years – looking at each year and reevaluating. Reevaluating is a frequent re-occurrence for us. As educators you want to teach and expect learning from a child. As a parent you want to see learning and growth for your child as a whole person. Sometimes this intertwines and meshes well. Sometimes it does not. What works well for one does not always work well for the groups or the sibling. But we have the freedom adapt on the spot, to better meet our children's needs; something that just cannot happen in a classroom. Later this week Mary M. will give us a glimpse into the reality of homeschooling and address the "s word" – socialization.